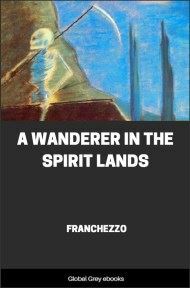 Written through the psychic medium A. Farnese in 1896, Wanderer In The Spirit Lands is the apparently true autobiography of Franchezzo, an Italian socialite who squanders his life on 'wine, women and song.' 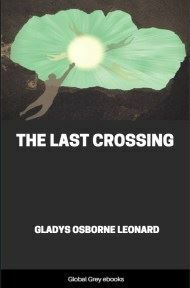 After an untimely death, he finds his spirit wandering in one of the dark lower worlds, alone and hopeless except for continued messages of love his young wife sends him through her prayers. I have been a Wanderer through a far country, in those lands that have no name--no place--for you of earth, and I would set down as briefly as I can my wanderings, that those whose feet are pointed to that bourn may know what may in their turn await them. On earth and in my life of earth I lived as those do who seek only how the highest point of self gratification can be reached. If I was not unkind to some--if I was indulgent to those I loved--yet it was ever with the feeling that they in return must minister to my gratification--that from them I might purchase by my gifts and my affection the love and homage which was as my life to me. I was talented, highly gifted both in mind and person, and from my earliest years the praise of others was ever given to me, and was ever my sweetest incense. No thought ever came to me of that all self-sacrificing love which can sink itself so completely in the love for others that there is no thought, no hope of happiness, but in securing the happiness of the beloved ones. In all my life, and amongst those women whom I loved (as men of earth too often miscall that which is but a passion too low and base to be dignified by the name of love), amongst all those women who from time to time captivated my fancy, there was not one who ever appealed to my higher nature sufficiently to make me feel this was true love, this the ideal for which in secret I sighed. In everyone I found something to disappoint me. They loved me as I loved them--no more, no less. The passion I gave won but its counterpart from them, and thus I passed on unsatisfied, longing for I knew not what. Mistakes I made--ah! how many. Sins I committed--not a few; yet the world was often at my feet to praise me and call me good, and noble, and gifted. I was feted--caressed--the spoilt darling of the dames of fashion. I had but to woo to win, and when I won all turned to bitter ashes in my teeth. And then there came a time upon which I shall not dwell, when I made the most fatal mistake of all and spoilt two lives where I had wrecked but one before. It was not a golden flowery wreath of roses that I wore, but a bitter chain--fetters as of iron that galled and bruised me till at last I snapped them asunder and walked forth free. Free?--ah, me! Never again should I be free, for never for one moment can our past errors and mistakes cease to dog our footsteps and clog our wings while we live--aye, and after the life of the body is ended--till one by one we have atoned for them, and thus blotted them from our past. And then it was--when I deemed myself secure from all love--when I thought I had learned all that love could teach--knew all that woman had to give--that I met one woman. Ah! what shall I call her? She was more than mortal woman in my eyes, and I called her "The Good Angel of My Life," and from the first moment that I knew her I bowed down at her feet and gave her all the love of my soul--of my higher self--a love that was poor and selfish when compared to what it should have been, but it was all I had to give, and I gave it all. For the first time in my life I thought of another more than of myself, and though I could not rise to the pure thoughts, the bright fancies that filled her soul, I thank God I never yielded to the temptation to drag her down to me. As so time went on--I sunned myself in her sweet presence--I grew in holy thoughts that I deemed had left me for ever--I dreamed sweet dreams in which I was freed from those chains to my past that held me so cruelly, so hardly, now when I sought for better things. And from my dreams I ever woke to the fear that another might win her from me--and to the knowledge that I, alas! had not the right to say one word to hold her back. Ah, me! The bitterness and the suffering of those days! I knew it was myself alone who had built that wall between us. I felt that I was not fit to touch her, soiled as I was in the world's ways. How could I dare to take that innocent, pure life and link it to my own? At times hope would whisper it might be so, but reason said ever, "No!" And though she was so kind, so tender to me that I read the innocent secret of her love, I knew--I felt--that on earth she never would be mine. Her purity and her truth raised between us a barrier I could never pass. I tried to leave her. In vain! As a magnet is drawn to the pole, so was I ever drawn back to her, till at last I struggled no more. I strove only to enjoy the happiness that her presence gave--happy that at least the pleasure and the sunshine of her presence was not denied me. And then! Ah! 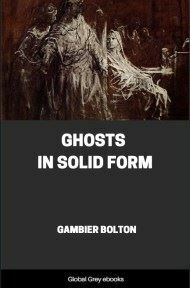 then there came for me an awful, and unexpected day, when with no warning, no sign to awaken me to my position, I was suddenly snatched from life and plunged into that gulf, that death of the body which awaits us all. And I knew not that I had died. I passed from some hours of suffering and agony into sleep--deep, dreamless sleep--and when I awoke it was to find myself alone and in total darkness. I could rise; I could move; surely I was better. But where was I? Why this darkness? Why was no light left with me? 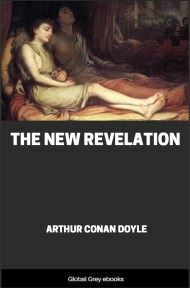 I arose and groped as one does in a dark room, but I could find no light, hear no sound. There was nothing but the stillness, the darkness of death around me. Then I thought I would walk forward and find the door. I could move, though slowly and feebly, and I groped on--for how long I know not. It seemed hours, for in my growing horror and dismay I felt I must find some one--some way out of this place; and to my despair I seemed never to find any door, any wall, anything. All seemed space and darkness round me. Overcome at last, I called out aloud! I shrieked, and no voice answered me. Then again and again I called, and still the silence; still no echo, even from my own voice, came back to cheer me. I bethought me of her I loved, but something made me shrink from uttering her name there. Then I thought of all the friends I had known, and I called on them, but none answered me. Was I in prison? No. A prison has walls and this place had none. Was I mad? Delirious? What? I could feel myself, my body. It was the same. Surely the same? No. There was some change in me. I could not tell what, but I felt as though I was shrunken and deformed? My features, when I passed my hand over them, seemed larger, coarser, distorted surely? Oh, for a light! Oh, for anything to tell me even the worst that could be told! Would no one come? Was I quite alone? And she, my angel of light, oh! where was she? Before my sleep she had been with me--where was she now? Something seemed to snap in my brain and in my throat and I called wildly to her by name, to come to me, if but for once more. I felt a terrible sense as if I had lost her, and I called and called to her wildly; and for the first time my voice had a sound and rang back to me through that awful darkness.